A powerful design which has proven to be very easy to trim to top speed. With this mainsail, you use plenty of backstay tension when flattening the sail as the breeze picks up. This in turn gives automatic forestay control to the jib. It comes with two full-length top battens (Light and Medium/Heavy). New for 2018 season, the KV-5 is an all-purpose Mainsail, built from hard tempered Dacron. It was used to win the 2017 Norwegian Nationals. This sail is very quick and easy to trim to varying wind speeds. This sail matches perfectly with the RE-7 Jib. This is a powerful jib with a generous foot skirt. 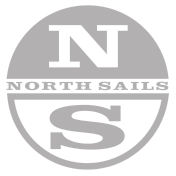 This sail is designed to be trimmed on the forestay, giving the sail extra area in lighter winds. It is designed to compliment the XT-8 Mainsail. New for the 2018 season, this cross-cut Dacron Jib is designed to compliment the KV-8 Mainsail. It was used alongside the KV-8 mainsail to win the 2017 Norwegian Nationals.